Love picking up bargains in duty free but not going on holiday this year? Debenhams could be the answer to your problems! One of the great things about jetting off on a summer holiday abroad, other than the sunshine, is of course duty free shopping at the airport! So, If the purse strings are a bit tight this year and you have switched sunny climes for a traditional English holiday, you’ll be pleased to know you can still pick up a summer beauty bargain at Debenhams as they are offering selected fragrances and beauty products at duty free prices. 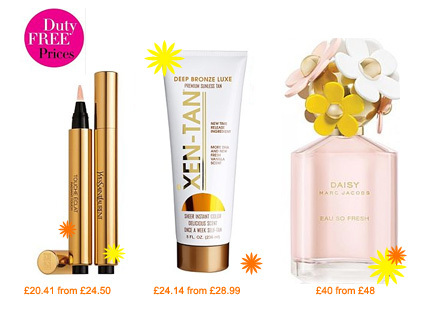 For a slice of sunshine in what has been a rather rainy June so far you can pick up Xen Tan Deep Bronze Luxe for £24.15 instead of £28.99, the ever popular and much loved Yves Saint Laurent Touche Eclat for £20.41 instead of £24.50 and the gorgeous new Marc Jacobs Daisy Eau So Fresh 75ml for £40 instead of £48. The offer is for a limited time only so scoot on over to the Debenhams website to take a look at all of the great offers.